Keeping you right up-to-date with all the latest developments on the All About Agatha Christie website. Agatha Christie Guest Book: Many thanks for visiting the All About Agatha Christie website. Any feedback you have would be gratefully received. Continue reading "Agatha Christie Guest Book"
Agatha Christie Links: Only the very best websites make it on to this page. 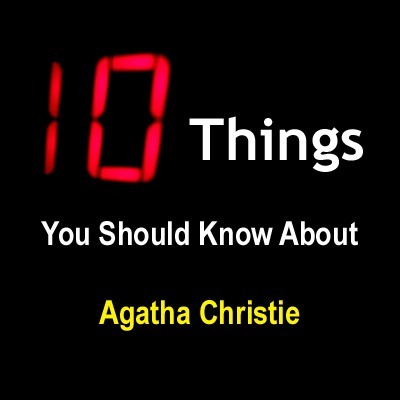 Continue reading "Agatha Christie Links"
Continue reading "10 Things You Should Know About Agatha Christie"
Continue reading "How to Host Successful Murder Mystery Parties, Detective Games, Murder Mystery D"
Continue reading "Introducing The Best Free Murder Mystery Games Available Online"
Miss Marple afternoon tea anyone? Not only does she knit and solve crimes but Agatha Christie's quintessentially English detective Miss Marple makes an afternoon tea to die for. Continue reading "How To Make A Miss Marple Afternoon Tea"
Continue reading "Wonderful collection of Quotes About Happiness"
Continue reading "Wonderful collection of Quotes About Marriage"
Continue reading "Wonderful Collection of Quotes About Life"
Continue reading "Wonderful collection of Friendship Quotes & Sayings"
Continue reading "Wonderful collection of Love Quotes & Sayings"
Continue reading "Wonderful collection of Quotes & Sayings"
The murder mystery questions page is a knowledge sharing resource where anybody can ask or answer a question relating to the fascinating world of murder mystery. Continue reading "Murder Mystery Questions And Answers (Q & A) Page"
Fear Paints A Picture was first broadcast on the 13th April 1943 as part of the CBS 'Suspense' radio drama. Continue reading "Fear Paints A Picture: Classic Radio Show"
The ABC Murders was first broadcast on the 18th May 1943 as part of the CBS Suspense radio drama series. Continue reading "The ABC Murders: Classic Radio Version"
The Lodger was first broadcast in 1940 as part of the CBS Suspense radio drama series. Continue reading "The Lodger: Classic Radio Drama "
Continue reading "10 Things You Should Know About Miss Marple"
Continue reading "10 Things You Should Know About Hercule Poirot"
Agatha Christie Store: Showcasing a great collection of gift ideas. Continue reading "Agatha Christie Store"
Agatha Christie poll page featuring a series of questions that tend to divide opinion. Continue reading "Agatha Christie Poll Page"
Agatha Christie Trivia: On an occasional basis, I intend to share little snippets of interesting information with the visitors to the website. Continue reading "Agatha Christie Trivia"
Continue reading "Agatha Christie Novels: The Old Sleight of Hand Trick "
Continue reading "Agatha Christie's Disappearance"
Continue reading "Witness For The Prosecution"
Parker Pyne Investigates is a collection of short stories. This is possibly one of Agatha Christie's lesser-known books, but well worth a read. The Listerdale Mystery is the title of a collection of twelve short stories by Agatha Christie, which are for the most part lighthearted adventures, but with a few rather more sinister tales as well. Continue reading "The Listerdale Mystery"
In Murder on the Orient Express is brilliantly plotted and for those who have never read the book before, the denouement (one of Agatha Christie’s best in my opinion) is astounding. Continue reading "Murder on the Orient Express"
In The Thirteen Problems, a group of six friends are having a sociable evening at Miss Marple’s charming house when the conversation gets round to unsolved mysteries. Continue reading "The Thirteen Problems"
Continue reading "Ordeal by innocence"
After The Funeral opens with all the requisite elements of a classical murder mystery. The family of the recently deceased Richard Abernethie are gathered for the reading of his will. Continue reading "After The Funeral"
They Do It With Mirrors is a wonderful title for this novel, because at the heart of the plot is a brilliantly concealed conjuring trick. Continue reading "They Do It With Mirrors"
Continue reading "They Came to Baghdad"
Continue reading "A Murder Is Announced"
Agatha Christie. Find out all about the queen of crime. Her biography, her writing, her detectives and much more. Continue reading "Agatha Christie: A Free & Comprehensive Guide To Her Life & Work"
Crooked House is a very good murder mystery and when everything is explained, I am sure most first time readers will find they have once again been bamboozled. Continue reading "Crooked House "
Continue reading "Taken at the Flood "
Continue reading "Sparkling Cyanide "
Death Comes As The End is surely Agatha Christie’s most bizarre novel. The story takes place in Ancient Egypt about 2000 BC and concerns a series of murders within the family of the Ka priest Imhotep. Continue reading "Death Comes As The End"
Towards Zero is vintage Agatha Christie in that it involves murder in an English Country House, with a varied assortment of suspects. Continue reading "The Moving Finger"
Continue reading "The Body in the Library"
N or M is not the usual murder mystery we associate with Agatha Christie, however, it is an exciting spy yarn and there are murders along the way. Continue reading "N or M"
Evil Under the Sun is one of Agatha Christie’s most diabolically clever murder mystery plots and I take my hat off to anyone who manages to work it all out. Continue reading "Evil Under the Sun"
One Two Buckle My Shoe: It would appear that Hercule Poirot cannot even visit his dentist without murder rearing its ugly head! Continue reading "One Two Buckle My Shoe"
Continue reading "And Then There Were None"
Continue reading "Hercule Poirots Christmas"
Continue reading "Murder in Mesopotamia"
Continue reading "Why Didn't They Ask Evans"
Continue reading "Peril At End House"